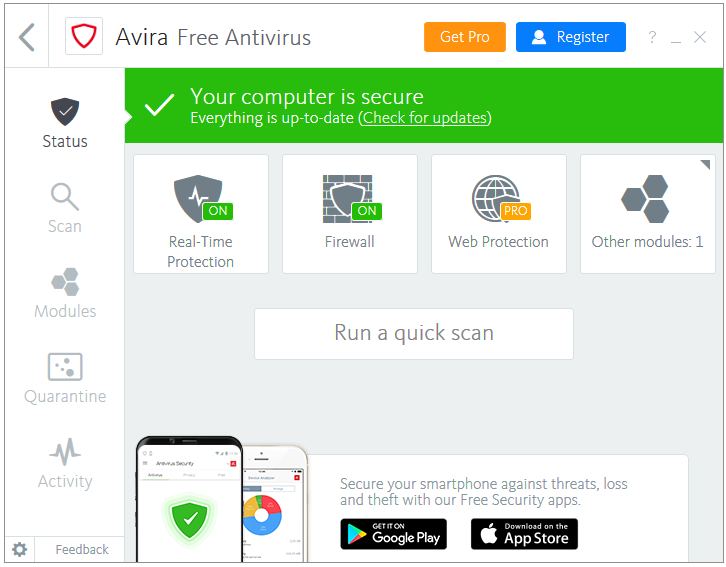 Home » PC » Antivirus & Security » Avira Free Antivirus 2019 Review – Essential Complete Protection for Windows 10. Best Free Antivirus Products for Windows PC in 2019 – Avira Free Antivirus. 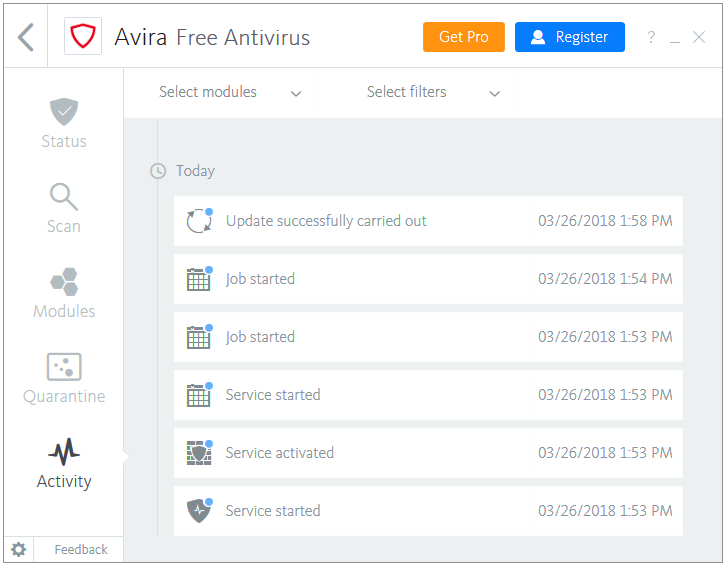 Avira Free Antivirus includes their famous Antivirus engine called Macrovirus that protects from various kinds of malware such as Viruses, Worms, Trojans, Ransomware, etc. The Avira Protection Cloud technology scans files using their Cloud engine for malware in real-time to provide even better protection. The Heuristic technology called AHeAD (Advanced Heuristic Analysis and Detection) protects against the new and unknown malware. The PUA shield detects the Potentially Unwanted Applications. Ransomware protection is included in the Free version as well. 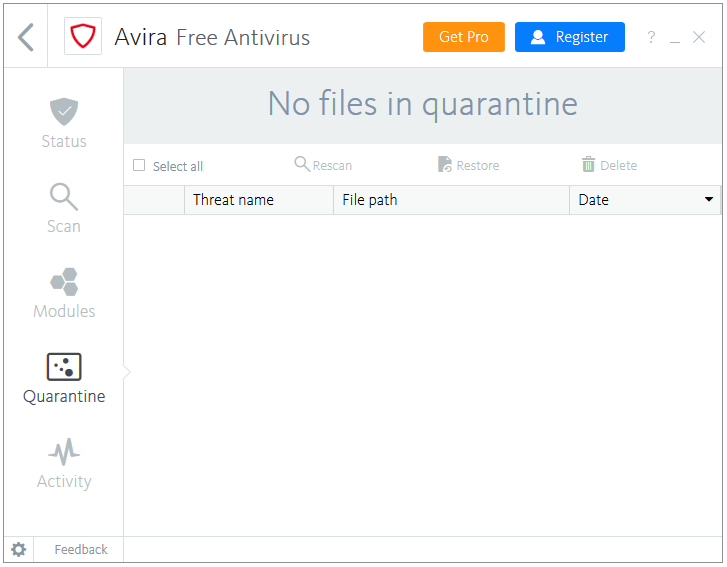 The Avira Browser Safety provides protections from trackers, and harmful websites. 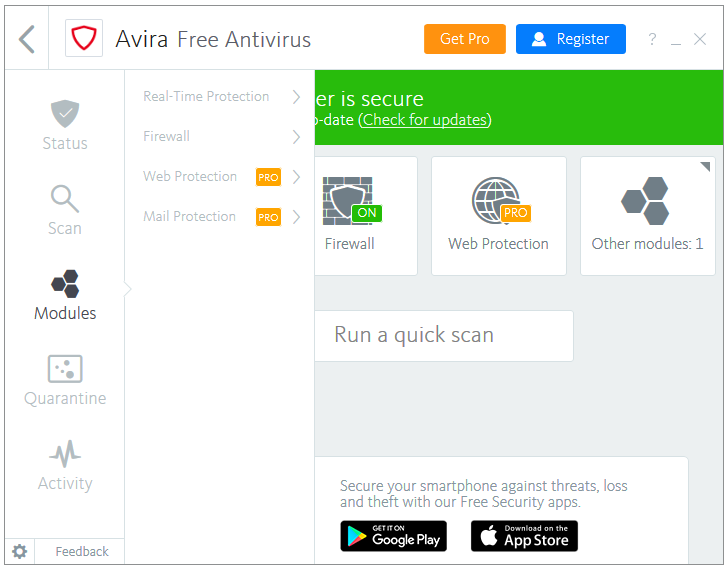 With Avira Free Antivirus, you get both of the components – a real-time antivirus and a firewall; the firewall listed in Avira is just the Windows Firewall integrated into Avira’s control panel. Virus Bulletin did not test Avira in their most recent test. Avira is a winner of the AV-TEST Top Product award. Avira is a winner of the AV-Comparatives Advanced+ award. Click on the Avira icon in the Notification area of your Taskbar to open the Avira Programs Manager. 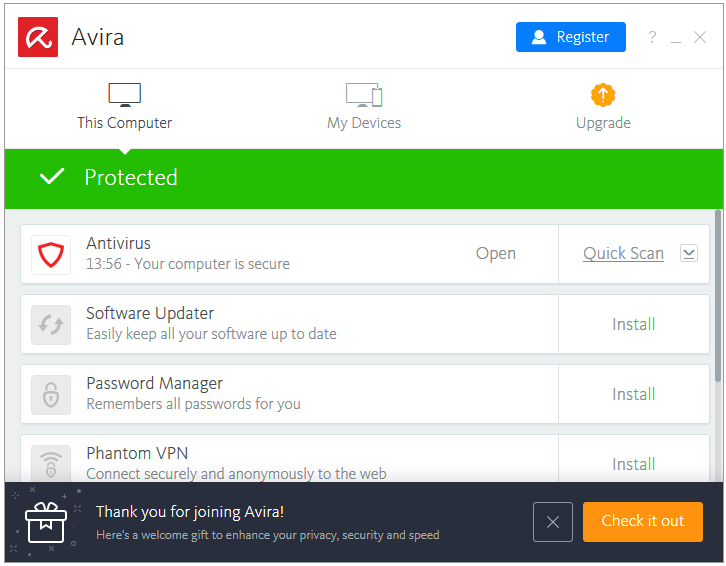 Then, click the Open link to open Avira Free Antivirus. 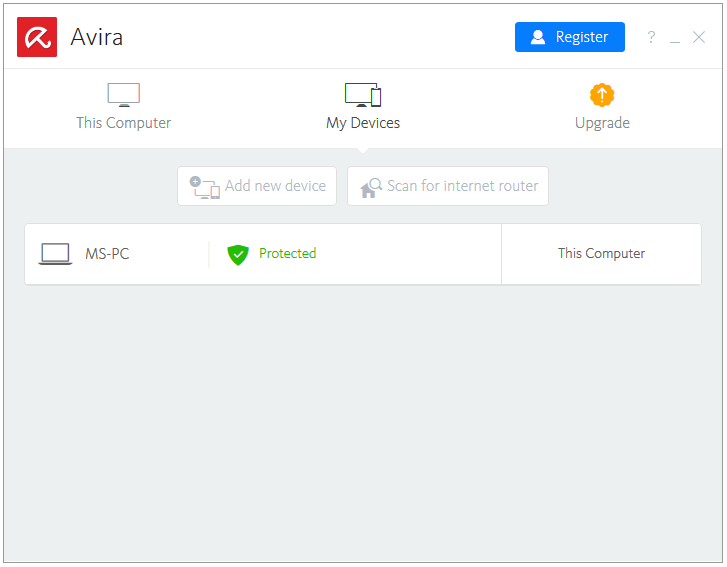 Inside the main interface of Avira Antivirus, there are four links along with one Run a quick scan button. Real-Time Protection – This is real-time protection engine of Avira. 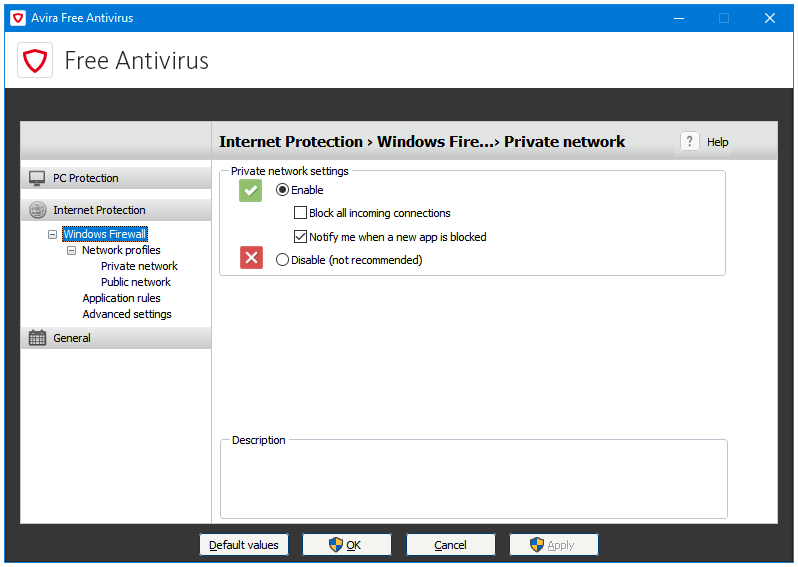 Firewall – The Firewall listed here is the default Windows Firewall. Other modules: 1 – Clicking on it shows the Mail Protection module, which is also a Pro version feature. Status – Clicking on the Status button takes you to the Home screen of the program. 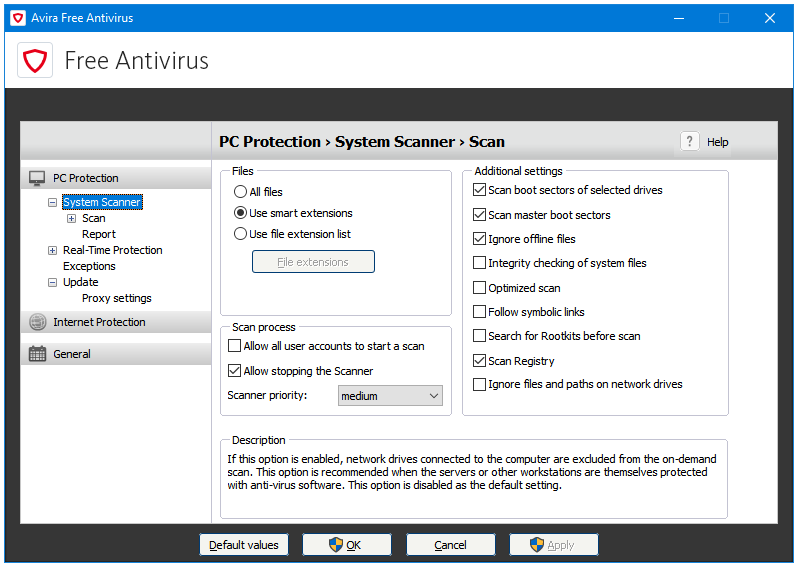 Scan – The Scan button displays the all four types of scans supported by this program. These are – Full scan, Quick scan, Custom scan, and Scheduler. Modules – The Modules link opens the same four links displayed in the main program window through the Status button, which are Real-Time Protection, Firewall, Web Protection, and Mail Protection. 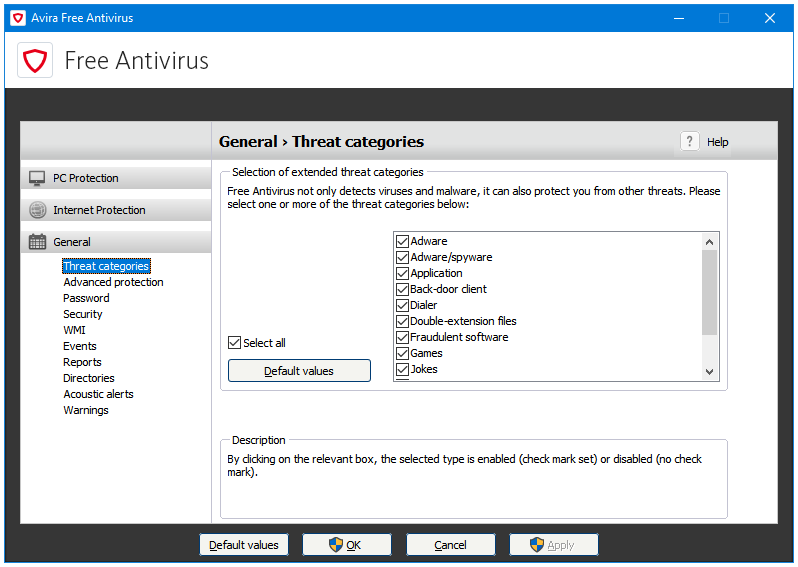 Quarantine – The Quarantine button takes you to the quarantine section of the antivirus where you can see the blocked or quarantined files, and perform actions such as Restore or Delete. Activity – The final button called Activity is a shortcut for Avira log storage location, which displays the important events and jobs performed by Avira on your computer. Clicking on the gear button located at the bottom-left corner of Avira’s home screen opens their Settings wizard. The Settings are divided into three categories. The first one called This Computer lists all of the programs offered by Avira. The My Devices tab lists the User Devices. 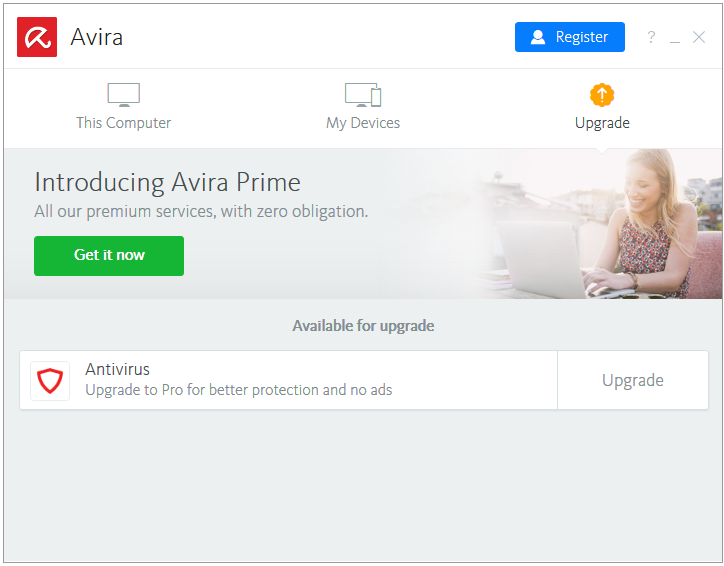 And, the third option called Upgrade is another promotion for the paid Pro version of Avira. Hard Disk Used: The installer is around 250 MB in size. After installation and an update, the Avira Free Antivirus uses around 2 GB of the disk space. 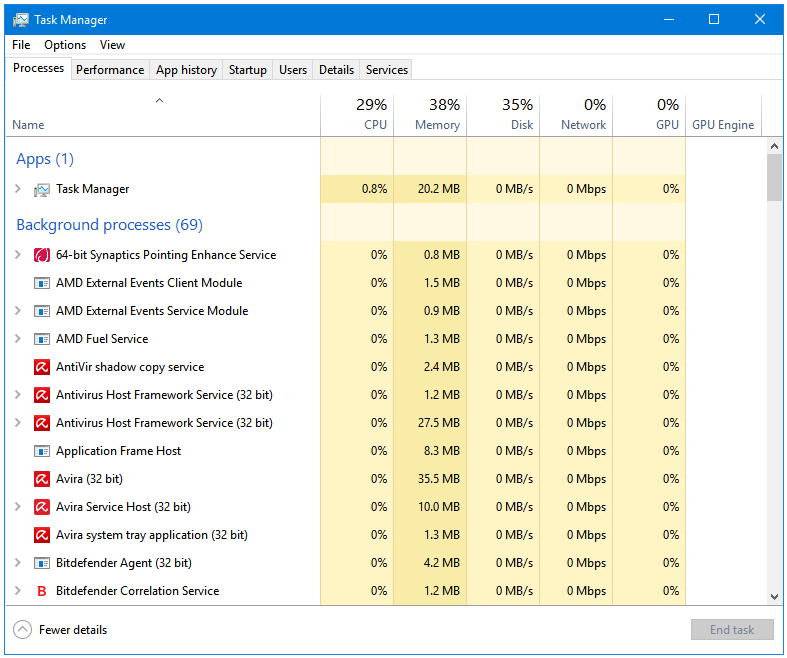 CPU and RAM Usage When Idle: Avira runs a lot of processes and services in the background. However, the RAM usage in only around 80 MB when it is idle. The CPU usage is stable at 0%. 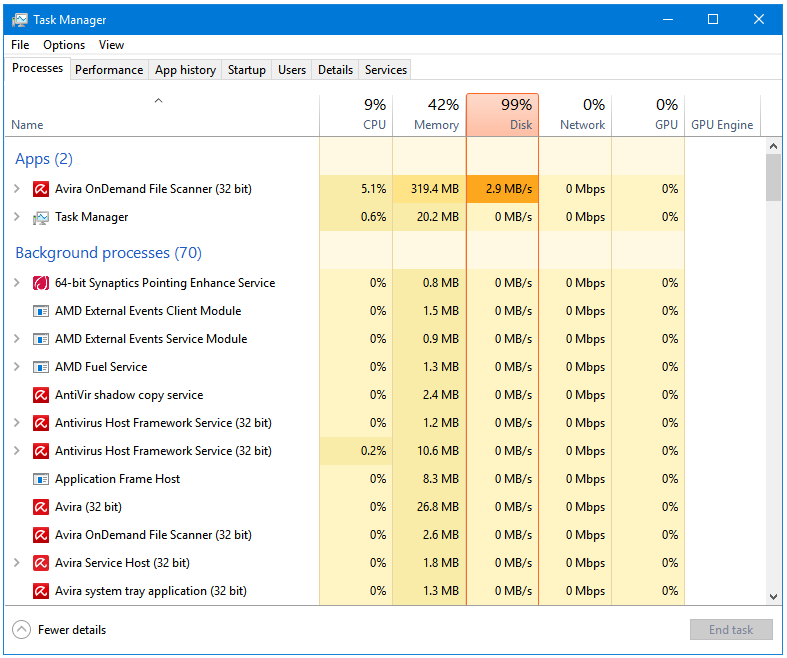 CPU and RAM Usage When Scanning: Avira uses a lot of RAM when it is performing a full system scan; it uses a total of around 350 MB of your RAM, with only the OnDemand File Scanner process using around 300 MB of it. The CPU usage is light though; it fluctuates between 2 to 10%, and is stable at around 5%. 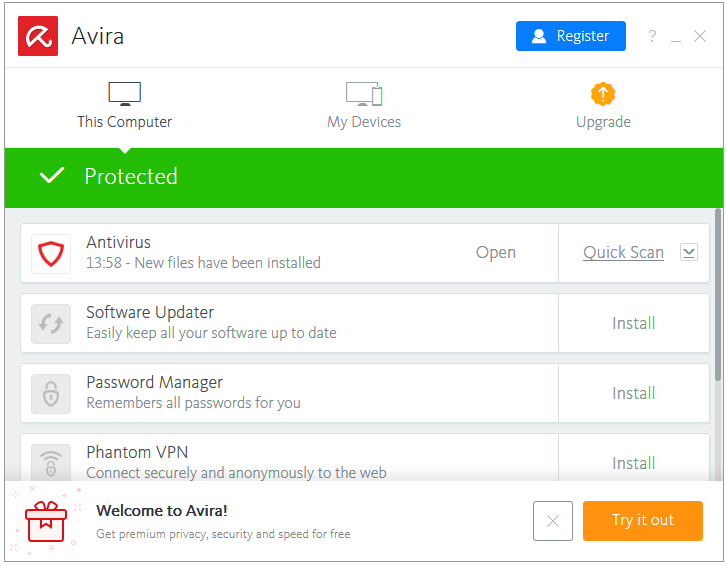 Avira is finally moving towards a better-looking design, but it’s taking a lot of time to do so. At this pace, by the time they complete the redesign, the flat design language would become out of date. The scanner called Luke Filewalker is still the same; its buttons have design elements right from the Windows XP era. 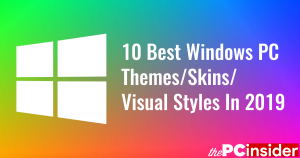 The main program window, and its linked slider windows are designed nicely with a beautiful flat theme. But that’s about it. The advanced settings windows still have the older interface. When you install the Avira Free Antivirus, you don’t get a notification area icon for the Antivirus program that you installed, instead you get one for another program called Avira Programs Manager. The Avira Programs Manager lists all of the additional programs that Avira has for you in addition to the Antivirus. So, the main antivirus is launched through this Programs Manager or Launcher, which makes the user click twice to access the antivirus program. This is not a user friendly trait. Too many upgrade advertisements. Big upgrade messages at the top, at the bottom, and inside various options. The main aim of a product redesign is to make it more user friendly, but Avira has managed to do the opposite. Clicking on most parts of the program will lead you to the upgrade page, and not the features of the program.